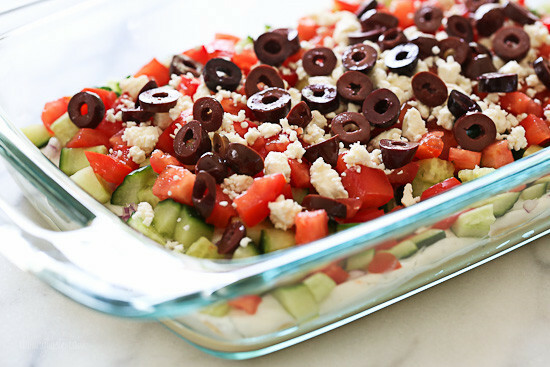 This Greek 7 Layer Dip is layered with hummus, yogurt, cucumbers, tomatoes, feta and olives. Grab a chip and serve this at your next party! You can prep all the ingredients ahead, but it’s best to layer it just before serving as the cucumbers tend to get watery if they sit too long. If you don’t eat dairy, or if you want to keep it vegan, skip the yogurt and add more hummus! 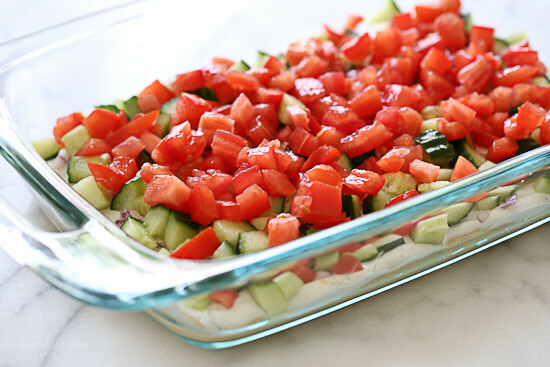 In an 8”x8” or 7″ x 11″glass dish, layer the hummus, yogurt mixture, red onion, cucumber, tomatoes, feta and olives. Serve with whole grain pita chips or baked corn chips. I cannot ever print any of your recipes? I made this for a summer party I had and everyone asked me for the recipe and actually ate it over the more calorie heavy options I made. 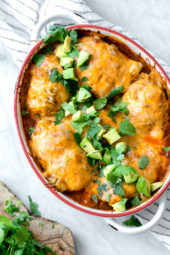 I am actually making it tonight for football Sunday! It is SO good. This was amazing! I will definitely bring it to share as an appetizer. Now I just need really low calories chips to dip in it! Delicious! I will go with the suggestion to use cucumbers as the “dipping chip” next time. 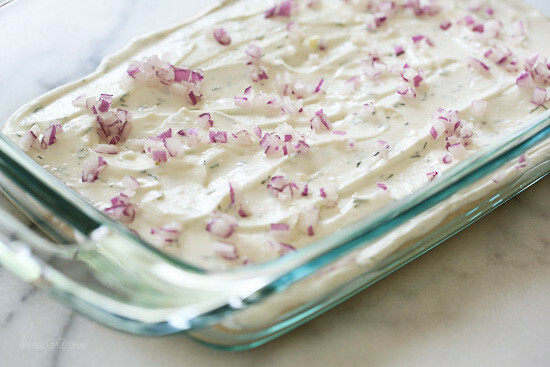 I made this dip for a Packer game today and it was a huge hit! 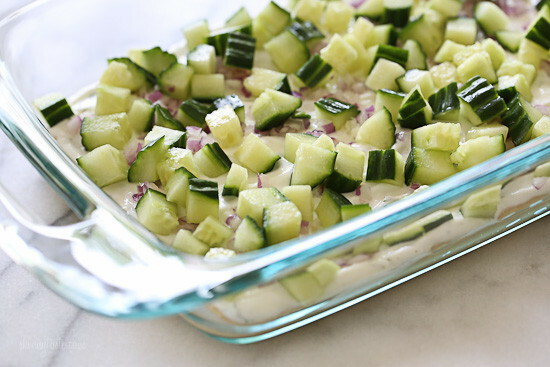 I substituted the yogurt mixture for your Skinnytaste tzatziki sauce and omitted the chopped cucumbers. I also added chopped pepperoncinis to the top for a little kick and served with pita chips. It was awesome! 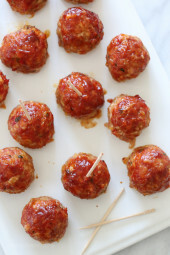 Thanks for another great recipe Gina! This was wonderful! I made it for a work potluck, so I prepped as much as I could in advance and stored the cucumber with paper towels to soak up the extra moisture. So far its going well, but I am not sure how it will hold up through the day. My container of hummus was 10 oz and I used the whole thing. How do you think it would be with flavored hummus? what is everyones favorite to serve this with? 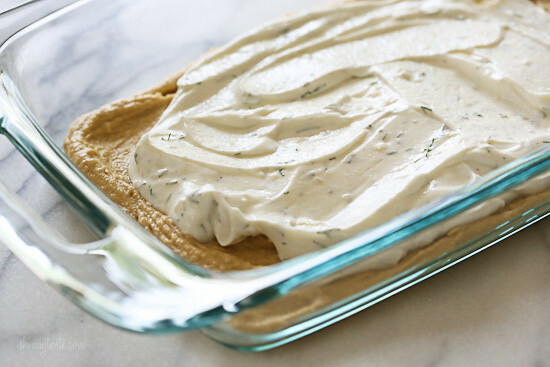 Do you dip celery and carrots into it? tortilla chips? I want to make it for the weekend cookout but im a bit lost on how its to be used. You can serve it with whole grain pita chips or baked corn chips. A nutritionist at my job gave us a similar recipe some months ago without the Greek yogurt layer. It's been a big hit and I've even gotten my boyfriend to eat it. I've even served it in individual ramekins. Can't wait to try it with the yogurt! A colleague shared this at work yesterday. I can't figure out how I missed this one on your blog. Delicious! Makes zucchini spears all the more tasty. I'm considering serving it as a side at my daughters wedding. Thank you for your delicious and health conscious recipes. 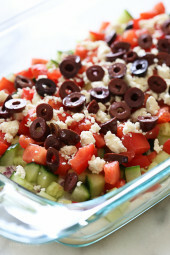 Think it'd change the taste drastically if I use regular black olives in place of the kalamata? I love kalamata but I'm afraid I won't be able to find them locally (small town). Love this! We made it for a family party and it was a hit! I made this for a family party this past weekend. Everyone loved it! This recipe is a keeper! LOVE THIS! Tasted great, very refreshing on a warm day. I used a store bought hummus and used one that had roasted garlic in it. Everyone in my family loved it. Yummy! I made this for a wedding shower and it was a huge hit! I served it with some Wheat Thin pita chips and it was awesome. Everyone was really surprised that I made it (I'm one of the youngest in the family so they assume I'm not experienced with cooking). Thanks for making me seem like a fancy chef, Gina! This looks really yummy. I did recently see something similar but they put it in individual cups. Thought that was a great idea. No double dipping!! if i'm omitting the yogurt because of dairy issues, is it best to mix the lemon, garlic, dill,etc to the hummus or just omit those too? 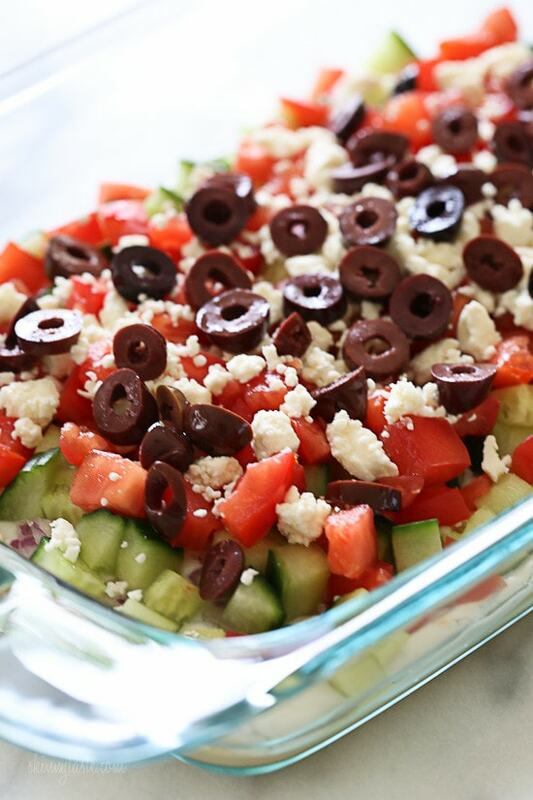 This Greek 7 layer dip is a great addition to any mezze spread! Some of the best ingredients in Greek cooking are in this dish. I like to take the extra step and marinate the olives overnight with oregano, olive oil, and lemon rind to give them additional flavor. These sound absolutely delicious! Definitely a recipe I will be trying! very pretty, but I cannot stand hummus-suggestion to replace that ingredient? skip the hummus. there's nothing greek about hummus. 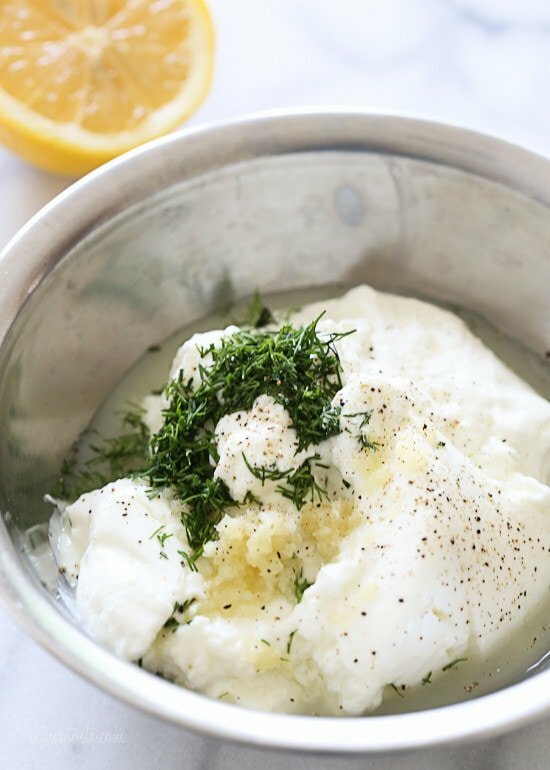 mix the yogurt with the garlic, minced cucumber, dill together to make the "tzatziki"
how about canned white beans – smashed or whole (definitely rinsed though!)? You can do skordalia instead of hummus. It is a delicious Greek potato puree that is excellent cold. Most Greek restaurants offer it! Okay, this looks delicious. I can't wait to try this. I have a birthday party coming up and I'm hosting. This should be perfect. I made this yesterday to take to a birthday party. It was a big hit! Served this over the weekend and it was a hit! I used an English cucumber and but it still became a bit watery. I made a big mezze platter recently – this would have been a fun addition! Made this last night & it was delicious! Did seed the english cucumber & tomato, but it was still a little watery. It didint matter because the flavor was great. My husband put some on his burger & it was amazing! One trick that helps with that is after chopping your veggies lay them on paper towels. The paper towels will soak up most of the extra moisture from the veggies. Just what I needed to take to a Belmont Stakes party tomorrow! That looks so delicious. Perfect for a summer party! To make it even easier to put together, I would imagine we could use prepared tsatsiki in place of the yogurt mixture. Such a FABULOUS idea Gina! LOVE it!! I could eat just that with a spoon! Nice combination and healthy as well! 🙂 Thank you for the recipe. All of my favorite things in one dish . . . I can hardly wait to try this. Looks simply amazing! I always prefer scooping out the seeds when using cucumber. I used English Cucumbers But that's a great idea! You can do what I did, skip the cucumber as a layer and use cucumber slices as chips instead! 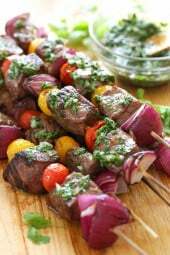 So perfect for summer get togethers! And a great way to eat lots of veggies!